An 100 level student, who is reportedly 19 years of age just bought his 16-year-old girlfriend a Benz, iWatch and Iphone X Max, all in a bid to surprise her. The Abuja based student, Zubairu, is causing a stir online after he gave his girlfriend, Nihat the ultimate surprised. He surprised her with a Mercedes Benz, iWatch and an iPhone X Max for her 16th birthday. The girlfriend is said to be an SS3 student. 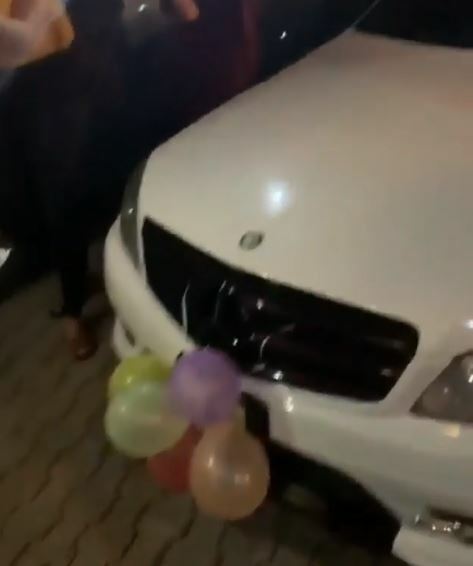 Zabairu can bee seen in the now viral video leading Nihat to where the Benz is parked, as friends and well wishers gathered to experience the special moment.